Trail running and road running are very similar activities in that both are cardio-intensive exercises measuring performance based on a distance divided by time. However, aside from this similarity, trail running is in fact an entirely different experience from road running for a number of reasons. Aside from the peaceful scenery you get to enjoy on back trails, the terrain presents an entirely different kind of challenge to the runner. And because no two natural trails offer the same experience, progressing through water, sand and/or mud, you have to expect and prepare for anything. With such a range of varied terrain, anything from rocks, sticks and sand can throw you off balance. This is a principle difference between road racing and trail racing; the earth literally moves and shifts beneath your feet. Because trail running is so different than road running, the equipment you need is also very different. You can’t expect to hit the trail in the same sneakers you use to take on road running. This is because to help you maintain your balance, trail running shoes are designed much differently. These designs include more aggressive treads, deeper lugs, stiffer soles and shock-absorbing plates to protect from the increased shock runners experience from rocks, twigs, etc. 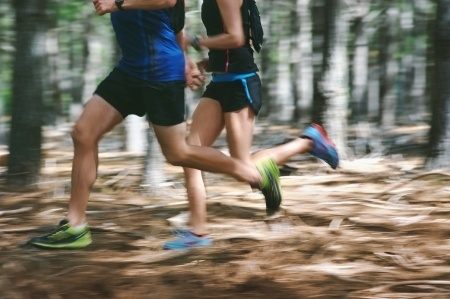 The basic components between trail running and road running are the same. An experienced road runner will have decent stamina to succeed at trail running. However, a trail runner needs much more balance and gains a much stronger core than the average road runner.